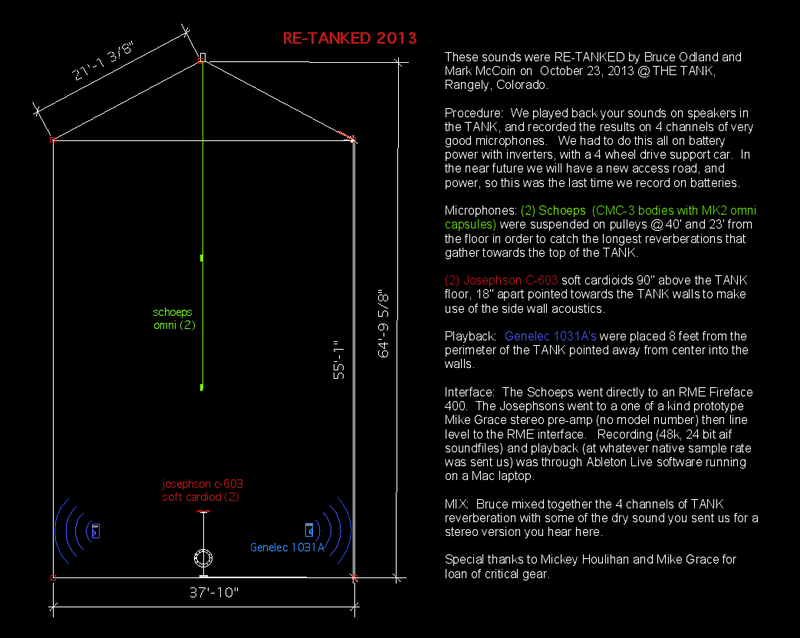 Backers from our successful Kickstarter campaigns sent us amazing sounds; we played them into The TANK (RE-TANKED them). We recorded the results with 4 great microphones, mixed it, and posted it here. Listen to what happens when a sound fills this 65′ tall, 40′ wide space, reflected by its 1/2 inch steel walls! Chorus waves are radio waves in the 0-10kHz range, generated in the intensely radioactive Van Allen Belts in the Earth’s magnetosphere. This event was recorded by the University of Iowa’s EMFISIS receivers and NASA’s RBSP Probes. Dr. Craig Kletzing has given me permission to use this beautiful recording as one of a number of atmospheric phenomena which Bob Bielecki and I are incorporating into a sound installation, ‘Wild Energy’. The installation is focused primarily on non-anthropogenic ‘sound’ waves from outside our hearing range, infrasound and ultrasound, sped up or slowed down respectively to bring them into range: solar oscillations, hydrothermal vents, gas vents on Kilauea, earthquakes, bats, moths and ultrasound generated within trees. Like ‘whistlers’, choruses are the exception, within our range but inaudible except by radio receivers. These sound emanate from sources which affect us fundamentally and are interconnected, an inaudible web in which we move. ‘Wild Energy’ will be included in the Caramoor Festival, Katonah, New York, along with a number of other site-specific sound installations in the summer of 2014. The California Myotis bat, Myotis californicus, unlike a number of other bat populations, is currently secure, and is found in many locations in California – rock-walled canyons with water being a preference. It is a crevice rooster and thus also found in old mines, brushy niches, buildings, even under tree bark, and is known for its slow and “erratic” flight pattern, as the BLM, California, describes it. This call is being used for echolocation and has been slowed down to bring it into our hearing range. It is an excerpt of sounds above and below the human hearing range which Bob Bielecki and I are incorporating into a sound installation, ‘Wild Energy’. The installation is focused primarily on non-anthropogenic ‘sound’ waves from outside our hearing range, infrasound and ultrasound, sped up or slowed down respectively to bring them into range: solar oscillations, hydrothermal vents, gas vents on Kilauea, earthquakes, bats, moths and ultrasound generated within trees. Like ‘whistlers’, choruses are the exception, within our range but inaudible except by radio receivers. These sound emanate from sources which affect us fundamentally and are interconnected, an inaudible web in which we move. ‘Wild Energy’ will be included in the Caramoor Festival, Katonah, New York, along with a number of other site-specific sound installations in the summer of 2014. I had my good friend Reed Weimer help me record the antique Tibetan Singing Bowls that I have collected. I would love to just hear what they sound like playing them in the tank someday. They even sound amazing in my ranch house in Denver. My re-tanked file sounds AWESOME! I’ve performed in large spaces all over the country including one of the grandest cathedrals and no space I’ve ever been in rivals the remarkable tone and presence of The Tank’s reverberation.